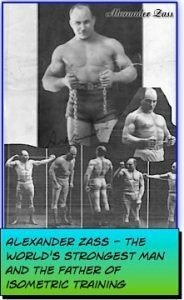 Alexander Zass, also known as "The Amazing Samson", was a famous strongman during the first half of the 20th century. He was known for feats of strength such as bending iron bars, snapping chains with his chest, and lifting 500 pound girders with his teeth. He could also carry small horses and would allow professional boxers to punch him in his stomach as hard as possible. All of these feats are amazing and many have never been replicated. How did he get so strong? Alexander Zass was born in Vilna, Poland in 1888, but spent his youth in Russia. As a boy, he was enthralled by the feats of strength performed by Circus Strongman and dedicated his efforts to becoming like them. He began training by climbing trees, as well as running with dumbbells and barbells. He very quickly became strong enough where he was able to join a Circus Troupe as a strongman and wrestler. While there he learned techniques from the other strongman, as well as developing his own methods. One of these was bending green branches to develop his grip strength. During the First World War he was captured as a Russian prisoner of war and held in an Austrian Prison camp. Shackled and kept in solitary confinement, he was worried that he was about to lose his magnificent physique as he could not exercise properly. As he feared, his body began to deteriorate. Desperate, he began to pull and push on his iron chains and bars in an effort to regain his strength. To his amazement, he not only regained his previous strength and physique, but he far surpassed it. Without realizing it, he had created the first system of isometric exercises in his prison cell! Zass continued to train, using his strength against the shackles that bound him, until one day he realized he was now so strong he could break them with ease. He bided his time until he saw an opportunity. He first snapped all of the chains that bound him. Next, he bent the bars of his prison window and ripped one clean out. He bent this bar into a J Hook and was able to make his escape. After the War, Alexander Zass adopted the stage name "The Amazing Samson". He toured Europe, performing the feats of strength I mentioned above. He also put together the first course of isometric exercises that I know off. The course utilized chains, just as he had used in prison. It was immensely successful and his fame spread far and wide. Today, Alexander Zass is known as the father of isometric exercises, but this was not his only claim to fame. He was also an accomplished animal trainer and worked for Russian Military Intelligence. He also acted as cover for his manager, Captain Howard, who was a British Secret Agent. Alexander Zass passed away in his home in Hockley, Essex in 1962. Below is some video of Zass performing some of his feats of strength. If you liked this article, help me spread the word by using these social networks below. Thanks!